Hey all! We’re having some issues with Blog.com, so I’m making this post short, because I may be having to make extensive changes to the entire blog. So I’m going to give some advice on proper sticky jumping. This assumes you have some experience sticky-jumping, and would like to learn some tricks I’ve found for unusual situations. Tip 1: Crouch before you jump. This one is very well-known, you may already have figured this out. Before detonating the stickies, crouch and you will fly almost three times as far. This increases your options for aiming, direction, and velocity so you can make almost any jump and land pretty much wherever you want, with practice. Tip 2: Air-strafing. While in the air, your directional keys will still work, as will your mouse. Don’t ask how, but the demoman can direct where he wants to go midair, meaning you can fly around corners, and slow down if you’re going to overshoot your mark. If you’re going to overshoot your mark so badly that you can’t even sow down in time, pirouette in midair and land on your point via a rapidly-shrinking spiral. These techniques are, like 1, commonly known. Tip 3: Maintaining momentum in water. Water is a double-edge sword. On one hand, you aren’t going to take fall damage, which is awesome. On the other hand deep water slows you to a crawl and some maps have very large bodies of water. But now you can have both upsides! Before you hit the water, hold down your jump key (default Space) and you’ll “surf” along the surface of the water. You’ll maintain full momentum, and reach land (or a wall, if you aim poorly) quickly. 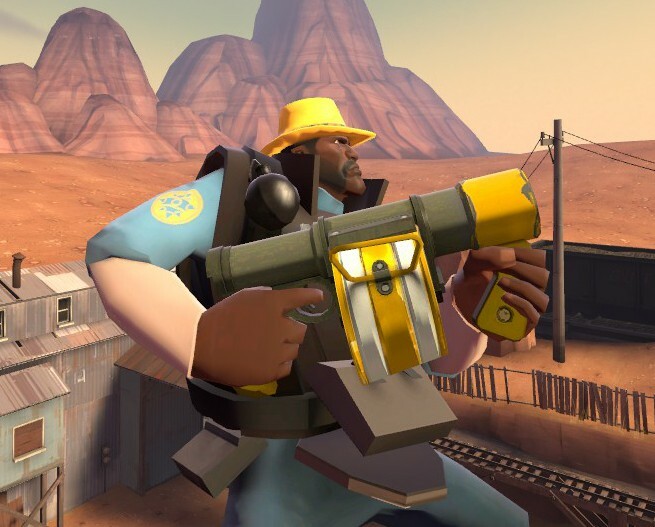 This technique was known as “sharking” in the days of Team Fortress Classic, but nowadays the term has been hijacked by a derogatory trading term. Balloon_race is a great map for practicing this. Tip 4: Negating fall damage. If you’re stuck at a high point and wish to reach a low point without taking falling damage, shoot a sticky down to your intended landing point, and detonate it once you are in the blast range but haven’t hit the ground yet. Depending on your timing, you can negate some or all of the falling damage. Perfectly timed regular stickies can deal ~20 damage this way if timed extremely well, but this trick is much easier with the Sticky Jumper. cp_orange_x3 is a great map for practicing this. And there you have it. Some quick tips, if you didn’t know them before, go practice them! It’s fun!